So you’ve decided to add a puppy to your family and are now faced with the daunting decision of choosing the best breed. If you are looking for a family dog that seeks companionship, loves having fun, and has a touch of goofy, then the bernedoodle is the perfect dog for you! The bernedoodle is a crossbreed between a Poodle and a Bernese Mountain Dog. Crossing these breeds brings out some of the best of both breeds, and it also helps reduce health risks associated with each individual breed. What positives does a bernedoodle bring from each breed? From the Bernese Mountain Dog it brings loyalty, friendliness with children, and an attitude of fun. From the poodle you will find intelligence, low shedding, and obedience. Ready to discover why the bernedoodle is the perfect fit for your family? Bernedoodles are a recent crossbreed. While some may have been bred earlier, many experts agree that the official start was in 2003. The original goal with the bernedoodle was to have a companion dog with fewer health problems and less shedding. The Bernese Mountain Dog has a wonderful character, but it does have high shedding and allergen concerns. They also have a shorter lifespan due in part to some of the health issues commonly found in the Bernese Mountain Dog breed. Breeding the Bernese Mountain Dog with a poodle created the ideal crossbreed that addressed the concerns of the Bernese Mountain Dog while maintaining its playful and loyal attitude. A designer dog called the bernedoodle. Designer dogs take a purebred poodle and cross it with another purebred breed. Most designer dogs are bred to link the poodle’s non-shedding coat with the positive characteristics of another breed. So what is the result of mixing two different pure breeds? Intentionally mixing two pure breeds creates a crossbreed, such as the bernedoodle. A pure breed means that there has been deliberate breeding over many generations, and this breeding has taken place among animals with common ancestors. If you mix the offspring of two pure breeds together, as long as they are the same species, you have a crossbreed. People have bred multigenerational bernedoodles together to emphasize different traits of the poodle or Bernese Mountain Dog. The most popular is still a first generation crossbreed coming directly from a purebred poodle and purebred Bernese Mountain Dog. There are three main variations of bernedoodles. The variation that you want will be affected by the size dog that you are comfortable with, particularly in regards to space considerations. Toy: Toy bernedoodles range from 12 to 17 inches in height and 10 to 24 pounds in weight. Miniature: Miniature bernedoodles range from 18 to 22 inches in height and 25 to 49 pounds in weight. Standard: Standard bernedoodles range from 23 to 29 inches in height and 50 to 100 pounds in weight. The size of the bernedoodle is determined by the size of the poodle used to breed the litter. Because they are a relatively new crossbreed, the average bernedoodle’s lifespan is not fully known. However, many experts agree that a lifespan of 12 to 15 years is accurate. Bernedoodles were bred to bring the best of the poodle and Bernese Mountain Dog together. 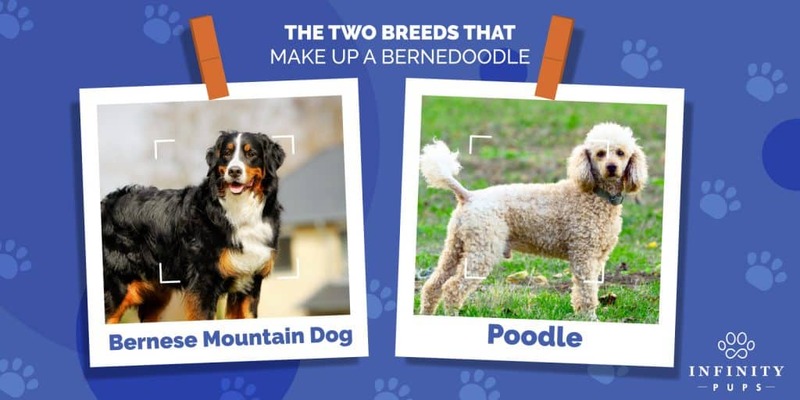 Because of this crossbreeding, it is not possible to give an exact prediction to a bernedoodle’s personality and character traits. However, bernedoodles do display a few dominant characteristics. Bernedoodles are one of the top crossbreeds for craving attention, love, and care from humans. Not only do bernedoodles love human interaction when they are playing; they also desire social interaction whenever possible. Bernedoodles want to be with people whenever they can. Whether it is snuggling on the sofa, being the center of attention, or just spending quality time together; the bernedoodle will love any time and attention that you can give! With a strong intelligence trait from poodles, bernedoodles are smart and can quickly adapt to various situations that they face. This also makes them more trainable than some breeds. Bernedoodles display a strong sense of commitment to their families, and particularly children that they know. Many people think most dogs are fun, but the bernedoodle takes this to the next level. Because of their love for human companionship, as well as their special bond with children, bernedoodles are a wonderful breed to spend quality time doing active and playful activities. The bernedoodle is also known as being a bit goofy and having a sense of humor. This comes through on the bernedoodle’s playful side. One thing to consider with bernedoodles, mainly the toy and miniature breeds, is to play with them carefully to avoid injury. Children should be trained on how to interact with bernedoodles in ways that will not cause harm. Bernedoodles are known to be more stubborn and headstrong than some breeds, especially when they are puppies. This is a trait that comes from the Bernese Mountain Dog. Although this may seem like a negative, bernedoodles will usually outgrow this as they become older and mature. Owners who train their bernedoodle consistently and patiently as a puppy, will quickly find this trait becoming less of an issue. 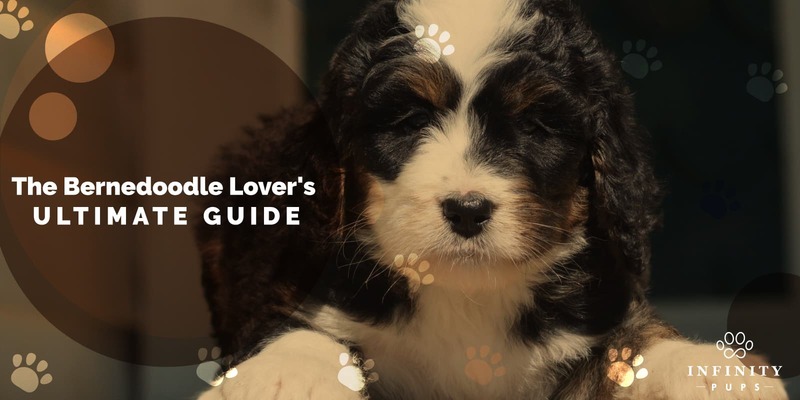 Like other animals, the exact characteristics of the bernedoodle will vary based on the puppy that you choose, the environment where it is raised, and regular attention and care that it receives. There are a few characteristics of the bernedoodle that some people may not find ideal for their particular situation or wants. These are not necessarily negative characteristics, but they should be considered if you desire a breed that has these specific traits. The bernedoodle is an active, playful dog and requires daily exercise. As a general recommendation bernedoodles should get a minimum of 30 minutes of daily exercise. This can include playing in the backyard or local park, going on a walk or run, or swimming. Keep in mind that puppies should not be involved in vigorous exercise activities such as jogging until they are six or eight months of age. Over-exercising at an early age can cause joint problems. Begin with taking your puppy on short walks with frequent breaks. The bernedoodle may not be the best breed for you if you are looking for a low-energy dog that will not require regular aerobic activity. Because they enjoy human interaction, the bernedoodle does not make the best watchdog. The bernedoodle is not as friendly to strangers as some breeds. However, it will not bark as quickly at a stranger or protect a child like watchdog breeds. Space is a concern with any pet, and bernedoodles are no different. Because of their need for regular exercise and the potential size of the standard variation, you need to make sure you have enough space in your house or back yard for your bernedoodle. Many people do not recommend standard bernedoodles for small apartments or spaces because of their active nature and size. Toy bernedoodles are the best option if you have limited space. Although the bernedoodle has the poodle’s DNA and easier groomability, that does not mean the bernedoodle’s coat can be ignored! It is important to perform regular grooming on your bernedoodle, preferably several times a week. The best grooming method is to use a slicker brush that works well with curlier hair. Owners find that bernedoodles respond well to regular grooming, especially if it is started when they are young. They quickly learn that grooming means quality time with their owners! How necessary is regular trimming since they are partly poodle? The majority of bernedoodles do not have straight hair, but it is possible. Bernedoodles with straighter coats means more shedding; therefore, these bernedoodles should be trimmed on a more regular basis. Overall bernedoodles do have the poodle’s curly hair, and care should be given to the coat. It is recommended that you clip the hair several times a year. Regular trimming results in a cleaner dog, and grooming is faster and more comfortable. If they are properly groomed and trimmed, bernedoodles will not need to be bathed regularly. The exception is if they are dirty and need to be cleaned. Similar to a poodle, their skin will have its own oils and moisture, and regular bathing can remove these from your bernedoodle. Other care for the bernedoodle is routine for dogs in general: Maintain trimmed nails, keep them clean, and brush their teeth several times a week with approved toothpaste. The health of your bernedoodle is obviously a critical factor in your bernedoodle’s quality of life as well as how long it will live. As mentioned before, the bernedoodle is a relatively new crossbreed, and there is not as much data on them as older breeds. However, bernedoodles are subject to many common health issues facing dog breeds. What is your first line of defense? The best time to be on the lookout for health issues with your bernedoodle is during regular grooming. Looking for sores, rashes, unusual skin or hair color, or other issues when you groom your bernedoodle will help you spot problems early. A common issue in many dog breeds is hip and elbow dysplasia. This occurs when a joint in the dog’s leg or hip becomes weakened or malformed. This can result in arthritis or even lameness if it goes untreated. Thankfully dogs can be tested for this since it is a genetic disorder. Ask your breeder if they have any dysplasia testing or health records on your puppy’s parents. If your puppy shows any negative signs, be sure to have your local veterinarian check them. Because of their long ears, watch for infections inside your bernedoodle’s ears. When moisture gets in their ear, a bernedoodle’s larger ears restrict airflow. This can result in ear infections if not thoroughly dried. This ear infection can occur in any breed with larger ears. The best prevention is making sure the ears are thoroughly dried after your bernedoodle has been swimming or gets significantly wet. Bernese Mountain Dogs have been known to be susceptible to cancer. Although the bernedoodle crossbreed is still young, many veterinarians have noticed that the majority of bernedoodles do not carry this genetic health concern. As was already mentioned, one of the original purposes of the bernedoodle crossbreed was a human companion dog that would not shed as much or cause as much allergic reaction. This raises a question: Do bernedoodles have less allergic affect than standard breeds? However, it does raise a second question that needs to be answered: What causes people to be allergic to dogs in the first place? The simple answer is dander. Dander is caused by dead skin cells that are shed by dogs and other animals, including humans. Because of their poodle genes, bernedoodles do tend to have less dander because of their shorter, curlier hair. It is important to note that low dander levels are best achieved when regular and proper grooming, trimming, and brushing is done. When it comes to choosing a dog, there are several options. You can purchase from a previous owner, adopt from a shelter, or buy them as a puppy. What are some pros and cons of the three places you can get your dog? The first 16 weeks of a puppy’s life are critical stages to their development. When buying a bernedoodle that is several years old, those early stages of development are past. This means that much of the training and development has already happened, whether good or bad! A well-trained dog will save you a lot of time and energy with training, but a poorly trained dog takes time and work to break bad habits. It can also take more time to bond with a bernedoodle if they were owned by a previous owner, particularly if they are older. Thankfully bernedoodles are social and can adapt quickly if they are properly loved. You should also ask for veterinarian records. This will allow you to keep up-to-date records on your dog’s health, as well as help you and your veterinarian know that your dog is current on all recommended vaccinations. Adopting from a shelter provides a loving home to a dog in need, and the results can be beautiful. Animal shelters are continually looking for good homes and families to adopt their animals, and this can be a way to give back to your local community and humane society. If you choose to adopt from a shelter, you do want to be aware that it might require some additional TLC and training. Much of this depends on the condition of your dog when it arrived at the animal shelter and the environment from which it came. 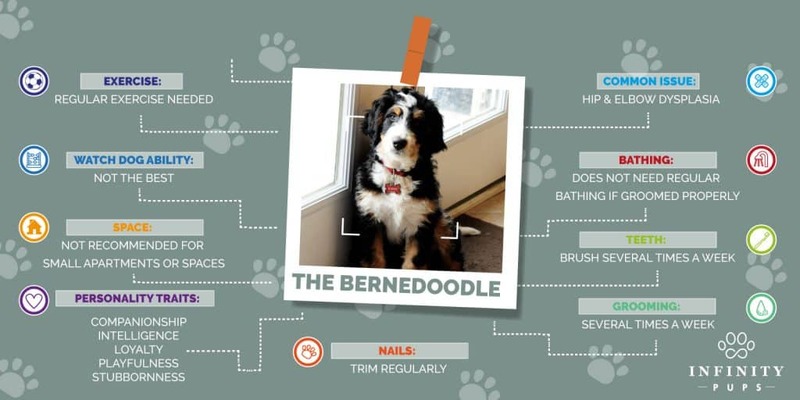 Many times the animal shelter may know very little about the dog’s background, so spending some time with your bernedoodle in person will help you learn more about its personality. Many people like to get their bernedoodles as puppies so that it is a part of their home for its full life. One of the biggest benefits of adding a bernedoodle to your home while they are still a puppy is that you maximize the amount of time you have to spend with it. Bonding with your bernedoodle as a puppy quickly establishes a robust and life-lasting bond between it and your family. Another benefit in purchasing a puppy is that you can provide it with a quality, controlled environment from day one. 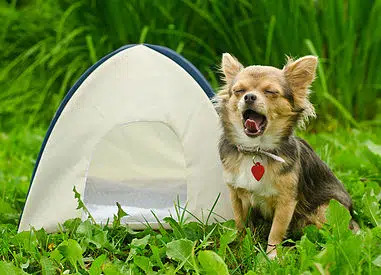 It may also provide you with the opportunity to meet one of the parents, and this will help you see the overall health and personality of your dog. One negative in purchasing a puppy is that you are responsible for all the training. You can either do all of the training yourself, or enroll your puppy in a local obedience school. If you are looking for a family-friendly, loyal, and fun dog; look no further than the bernedoodle! Purchasing a bernedoodle will ensure you and your family a companion that will love every minute of human interaction with you, and we guarantee that you will love every minute with your bernedoodle as well! If you are ready to add a bernedoodle to your family, head over to Infinity Pups to view our available bernedoodle puppies. All puppies listed with Infinity Pups are guaranteed not to be from puppy mills and they come with a 1-year health guarantee.